Fourth Row Center: Film Writings by Jason Bailey: In Theaters: "How to Train Your Dragon"
Dreamworks Animation tends to get treated like a second-class citizen by connoisseurs of computer animation, and not without reason. While their rivals at Pixar are turning out pictures that transcend the limitations of the form and rank among the best of all recent cinema, Dreamworks has turned out a steady stream of profitable but formulaic efforts like Bee Movie, Shark Tale, and the endless, witless Shrek and Madagascar franchises. But their latest effort, How to Train Your Dragon, is a step in the right direction; there’s no mistaking it for Up or Wall-E, but it’s a good-natured, low-key charmer. The setting is the time of the Vikings—specifically, the dragon-infested isle of Berk. “Most people would leave,” we’re told, “but not us. We’re Vikings. We have… stubbornness issues.” We’re brought into the tale by Hiccup (voiced by Jay Baruchel), the nebbish son of a fierce warrior who only wants to be taken seriously as a dragon slayer. However, when he gets the chance to prove his mettle, he finds he cannot bring himself to kill the “Night Fury” dragon he has brought down. Instead, he becomes secret friends with the creature, nursing it back to health and training it to be docile—and becoming something of a dragon whisperer on the isle in the process. The first clue that directors Dean DeBlois and Chris Sanders (who previously helmed Disney’s Lilo and Stitch) have their head on straight is in the voice casting; Baruchnel is joined by fellow Apatow company players Jonah Hill, Christopher Mintz-Plasse, and Kristen Wiig (all of whom pull laughs as much from their own timing and distinct comic personalities as from the script), while Craig Ferguson nearly steals the show as dragon trainer Gobber. America Ferrera and Gerard Butler get fewer opportunities to be funny, but fill the straight roles admirably. Character designs are also impressive—particularly that of Hiccup’s pet dragon “Toothless,” who starts off absolutely fierce but proves capable of softening easily to capture our sympathy. The development of their relationship gives the film its sweetness and heart, which develops into real pathos; by the time we get to the end of the second act, the picture is treading into E.T. territory. It’s also blessed with several crackerjack set pieces—the opening scenes have a nice energy and high spirit to them, while the first flight sequence is gripping and the visit to the dragons’ nest packs some knockout visuals. Some of the 3-D effects are cool (particularly the throwaway shots of Viking boats passing and fish under water), though I must be getting old, because 3-D mostly just gives me a headache. (It’s a pleasant enough diversion here, I suppose, but I can’t see that audiences will miss much by taking in the film in a mere two dimensions.) Some of the dialogue is mighty drab and utilitarian, and there’s one genuinely cringe-worthy moment, the kind of dated pop culture reference we’d expect from a Shrek movie —when Hiccup is congratulated by being told “You the Viking!” (That joke was old when Dreamworks put it into Antz a dozen years back.) And yes, the third act beats are awfully predictable. 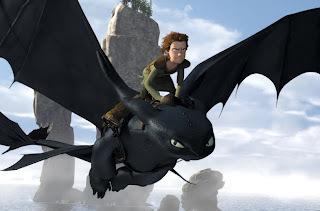 But by that point in the film, they’ve pretty much got us in their pocket; while by no means a classic, How to Train Your Dragon is sweet, likable fun. "How to Train Your Dragon" opens Friday, March 26 in wide release.